“To know how we obtain our justification, it is expedient to consider, first, how naughty [in the old meaning of the word: wicked] and sinful we are all, that be of Adam’s kindred; and contrariwise, what mercifulness is in God, which to all faithful and penitent sinners pardoneth all their offences for Christ’s sake. Of these two things no man is lightly ignorant that ever hath heard of the fall of Adam, which was to the infection of all his posterity; and again, of the inexplicable mercy of our heavenly Father, which sent his only begotten Son to suffer his most grievous passion for us, and shed his most precious blood, the price of our redemption. But it is greatly to be wished and desired, that as all Christian men do know the same, so that every man might acknowledge and undoubtedly believe the same to be true and verified, even upon himself; so that both he may humble himself to God and knowledge himself a miserable sinner not worthy to be called his son; and yet surely trust, that to him being repentant God’s mercy is ready to forgive. And he that seeth not these two things verified in himself, can take no manner of emolument and profit by acknowledging and believing these things to be verified in others. But we cannot satisfy our minds or settle our conscience that these things are true, saving that we do evidently see that God’s word so teacheth us. The commandments of God lay our faults before our eyes, which putteth us in fear and dread, and maketh us see the wrath of God against our sins, as St. Paul saith, Per legem agnitio peccati, et, Lex iram operatur [Through the law comes the knowledge of sin, and, the law works wrath], and maketh us sorry and repentant, that ever we should come into the displeasure of God, and the captivity of the Devil. The gracious promises of God by the mediation of Christ showeth us, (and that to our great relief and comfort,) whensoever we be repentant…we have forgiveness of our sins, [are] reconciled to God, and accepted, and reputed just and righteous in his sight, only by his grace and mercy, which he doth grant and give unto us for his dearly beloved Son’s sake, Jesus Christ; who paid a sufficient ransom for our sins; whose blood doth wash away the same; whose bitter and grievous passion is the only pacifying oblation, that putteth away from us the wrath of God his Father; whose sanctified body offered on the cross is the only sacrifice of sweet and pleasant savour, as St. Paul saith: that is to say, of such sweetness and pleasantness to the Father, that for the same he accepteth and reputeth of like sweetness all them that the same offering doth serve for. These benefits of God with innumerable other, whosoever expendeth, and well pondereth in his heart, and thereby conceiveth a firm trust and feeling of God’s mercy, whereof springeth in his heart a warm love and fervent heat of zeal towards God, it is not possible but that he shall fall to work, and be ready to the performance of all such works as he knoweth to be acceptable unto God. And these works only which follow our justification, do please God; for so much as they proceed from an heart endued with pure faith and love to God. But the works which we do before our justification, be not allowed and accepted before God, although they appear never so good and glorious in the sight of man. For after our justification only begin we to work as the law of God requireth. Then we shall do all good works willingly, although not so exactly as the law requireth by mean of infirmity of the flesh. Nevertheless, by the merit and benefit of Christ, we being sorry that we cannot do all things no more exquisitely and duly, all our works shall be accepted and taken of God, as most exquisite, pure, and perfect. 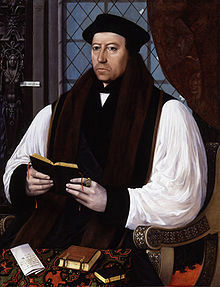 For Cranmer, the touchstone or reference point for wisdom is “all holy Scriptures.” He prays that we would not only hear the Scriptures as words, but “inwardly digest” them as the Word by which we may be comforted (i.e. strengthened). Cranmer views the Bible as providing both the grounds for our patience and the fuel for our strengthening. Such patience and strengthening are able to take us by the instrumentality of hope right up to the threshold of our present lives. After we cross this threshold, we shall receive the “everlasting life” promised in the last phrase. Cranmer invites us to love the Bible and learn it, not for its own sake, but for the sake of the cause for which it was written: our patience and our comfort. – Thomas Cranmer (1489-1556), “The Prayer and Saying of Thomas Cranmer, a little before Ms death, all written with his own hand, as followeth,” in Works, 2:565.